in the maintenance, installation or testing of low, medium and high vacuum systems. As a quality service, we can take into account your particular needs, and bias the course to your requirements. 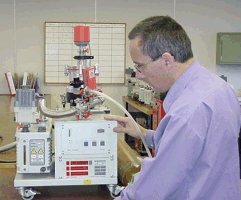 Training is delivered by a highly experienced vacuum engineer. We can offer many examples of applications and systems. We attend your site and bring the training package to you. We will provide/loan all the training materials and resource requirements. We normally provide vacuum equipment examples/experiments. We provide a certificate of course completion. We can offer tailor made courses, by choosing a mix of any of the modules described in the 2 or 3 day courses. We offer a 1 day course based on best vacuum practice for assembly workers/technicians. On customer site courses are charged at £4000 per day for England. Normally a maximum of 10 candidates per course, but this depends on the course taken and facilities available. travelling to and from your England site and UK hotel expenses for Willett Technical Services are included. In a training room we can hire local to your site, or perhaps a hotel conference facility.